This apartment is on the first floor which makes it ideal for easy access. Bread St is surrounded by a variety of shops/cafes/pubs and restaurants. The apartment is large, bright and clean and provides a great location to explore the many attractions nearby. 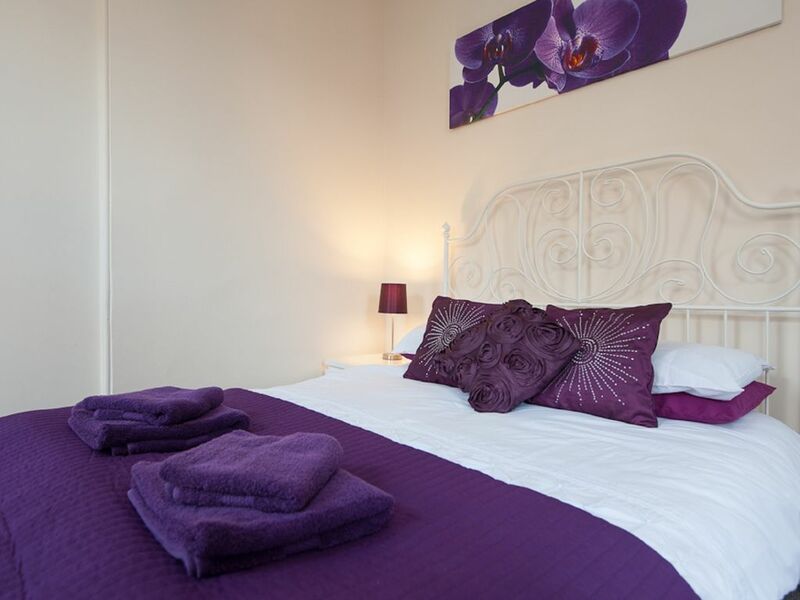 There are 2 large double rooms within the apartment and one of them has a large sofa bed suitable for extra guests. Both rooms have flatscreen TV’s, freeview and DVD players. The kitchen has all the facilities and equipment you need to fully self cater including a table for dining, flatscreen TV and integrated dishwasher. There is a separate utility room with a washing machine and tumble dryer. For ease of parking, there is a multi storey car park within a 2 minute walk of the apartment, although there is no real requirement for a car, as you could not get more central than this apartment which is right in the city centre. All towels, bedding, etc are supplied. Recently fully renovated and includes free high speed wireless broadband. Entry is anytime after 1pm. Check out is by 11am. All bookings are based on sharing. Early arrival and late check out can be arranged with additional cost will be determined by circumstance. Bookings are based on sharing. Overall nice flat...free Netflix, comfy beds, amenities all very close by, the hallway/entrance into the building looked a bit scary, could benefit from some paint...overall nice location, very close to the castle. Location is very good, everything is within walking distance- shops, restaurants etc.the apartment is beautiful and very clean. The apartment was wonderful ! Very up to date on appliances and very clean. Great location, clean, and bright. We loved this location. Short walk to Edinburgh Castle and many other attractions, restaurants, and pubs on our list. We made good use of the wonderful kitchen facilities. Sleeping arrangements were great and this unit would have easily accommodated two couples. Nice bathroom. The washer and dryer were a plus. We would consider this unit on another trip to Edinburgh. Property was convenient well equipped, clean and roomy. Loved the laundry option. Had some trouble getting keylock instructions. Needed more advanced info than the day of arrival because we were travelling and had limited access to wifi the day of. Caused us a bit of stress. I’m sorry you had trouble accessing the information. It was emailed 2 days in advance to you. I see that you called us and we resolved it over the phone straight away. Apologies for any stress caused. Prices are based on sharing. So up to 4 guests there are two double beds supplied, laundered. If 4 or less are staying and 3 beds are required then an additional £15 is required for sofabed laundry. (let us know after booking). If more than 4 guests then sofabed laundry is included.